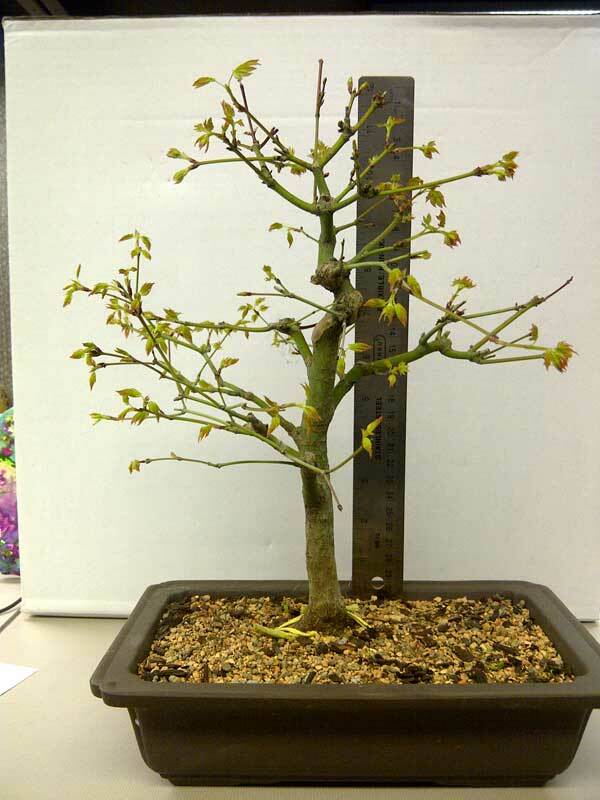 Green Mountain Maple - Where will the buds break in the future? What concerns me is that I don't know maples enough to know where leaf buds will break. I know they'll break on all the nodes, but what about the internodes? These two photos show a couple of the fairly long internodes that concern me. With a bald cypress, I would just wire out the branch and wait for buds to pop. Then just remove the ones I don't like. However, with maples, I'm out of my element. In the future, will any buds break between these nodes, in areas indicated by the white arrows? If so, how far into the future will that take? If I cut off the terminal nodes, the entire internode dies back to the previous node, right? 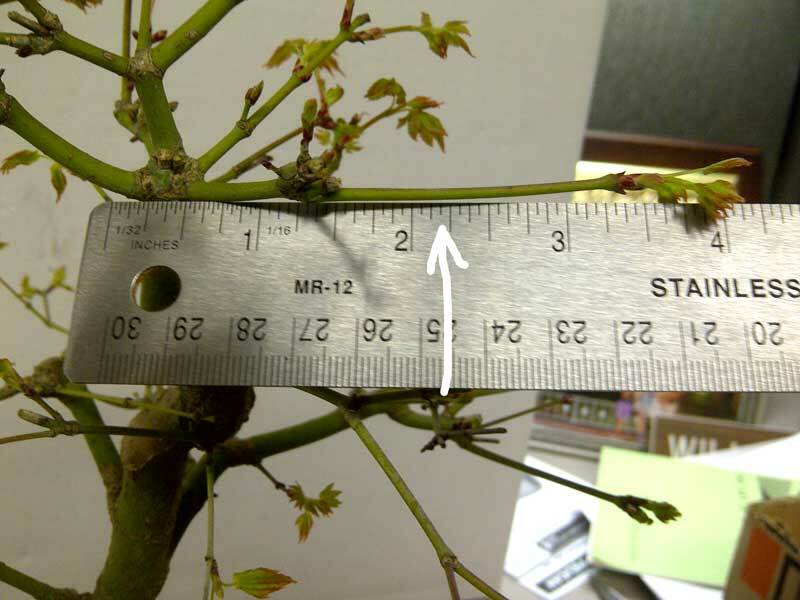 Re: Green Mountain Maple - Where will the buds break in the future? maples will only form buds at the nodes...they are easy to spot on maples...their habit makes them a bit of a challenge because of this...since they like to send out long shoots (especially when young), the length between nodes can be 6 inches or so, which of course is no good for bonsai...you have to prune them before they get too long (see walter palls article on hedge pruning that can be found here in the top threads section)...i have found its good to be creative with sacrifice branches (or sacrifice shoots in this case) to help fight this habit during developement...example: say you have a couple buds break at the same node...you can let one grow wild, but keep the other in check for correct node spcing...if you trim both, often the tree will just send out more shoots with long internode length...so, of you let the tree do what it wants with one of the branches, the other can be kept in check...again, this is especially true on younger trees...in the case of your tree...the internodes you are woried about i would let grow wild for the branch thickening effect at the same time keeping the other shoots in check to make sure the length between nodes doesnt get out of control...hope that made sense. Thanks for the reply. I believe I see what I need to do now. I like the general structure of the tree. I'm ready to do some refining. 1) A couple of places have 3 or more branches coming from the same point. I want to reduce to 2. 2) Cut long internodes back to earlier node points. This may mean removing more than one internode. I think I need to wait for the Spring growth to push out before wiring. Otherwise, I'll be re-wiring in a month or suffer wire scars. YUp, all sounds fine. The only thing to keep in mind is that acers have a tendency to bleed quite badly in early spring. 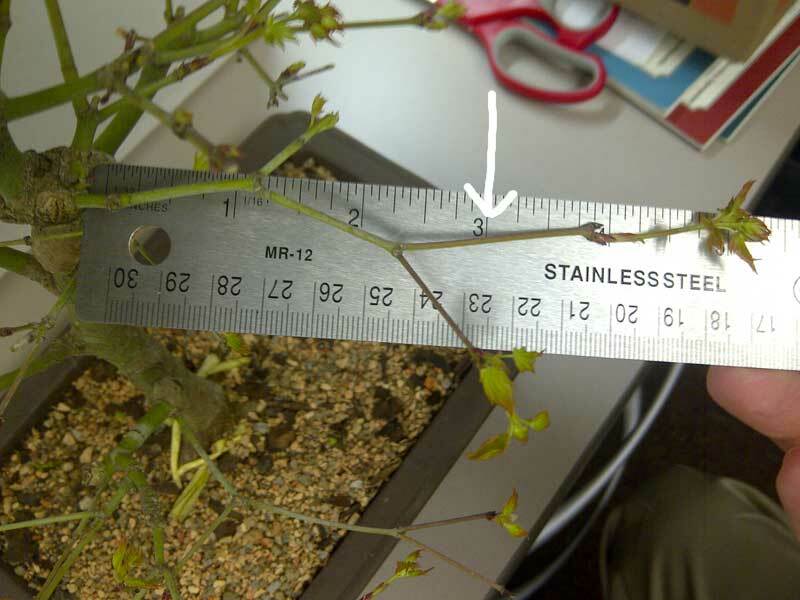 So do not prune to deep (thick branches) and/or let the plant go reasonably dry before cuttting. Or keep from pruning thicker branches untill winter. (Of course you can just take the risk and prune all now and probably not suffer any major problems). Wiring works easiest when the tree is without leaves. This could be a good tree to learn on ... maybe later you'll decide to get some taper down low. leatherback wrote: YUp, all sounds fine. The only thing to keep in mind is that acers have a tendency to bleed quite badly in early spring. So do not prune to deep (thick branches) and/or let the plant go reasonably dry before cuttting. Or keep from pruning thicker branches untill winter. (Of course you can just take the risk and prune all now and probably not suffer any major problems). yes...this...wire in fall right after leaf drop...thats also a good time to hard prune...there is also a period after the initial spring flush when you will notice the tree slows down...that period is also a good time to prune...from what i can, the parts you are talking about removing arent major branches or anything, so i dont think excessive bleeding will be an issue...so in this case, you can probably do it now and it wouldnt hurt the tree...but...you may notice that the node you cut back to will send out new shoots with long internodal lengths...i think that is also one of the reasons some people like to prune in fall...if you choose to prune now, i wouldnt worry too much because if the tree ends up with long internodes, you can always cut back to a node in fall and re-grow...just my opinion.